A suspect is in custody and another man is fighting for his life after a violent altercation this morning in the Arden Arcade area. Joseph Leonard, 60, was booked into the Sacramento County Main Jail earlier today for running a man over with his pickup truck. Leonard was arrested on a charge of attempted murder and is being held without bail. The incident left the victim with life-threatening injuries. Just before 7:00 a.m. today, Sheriff’s deputies were dispatched to a parking lot at Howe Avenue and Arden Way. Callers reported a fight between one man (later identified as Leonard) and two other men. While en route to the location, deputies received updated information that a man had been run over by someone driving a vehicle. Upon their arrival, deputies contacted Leonard, who was identified by witnesses as the driver of a pickup truck stopped at the location. A 34 year-old man was lying on the ground with extensive injuries. He was transported to a local hospital in critical condition. Leonard was taken into custody at the scene without incident. Investigation revealed that the victim and another man, who had since left the scene, were in some kind of altercation with Leonard outside of a fast food restaurant in the area. After the altercation, the victim was riding away on a bicycle. Witnesses reported seeing Leonard drive his truck toward the victim, then run into him, knocking the victim off his bicycle and onto the ground. 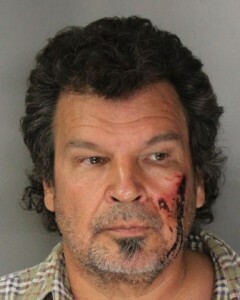 Leonard then reportedly exited his truck, and began to kick the victim in the head as he lay motionless on the ground. A bystander intervened by removing the keys from Leonard’s truck, then detaining Leonard at the scene until deputies could arrive. The circumstances surrounding the initial altercation are still under investigation, and the exact motive for the suspect’s actions is unknown. June 7, 2013 in Crime.